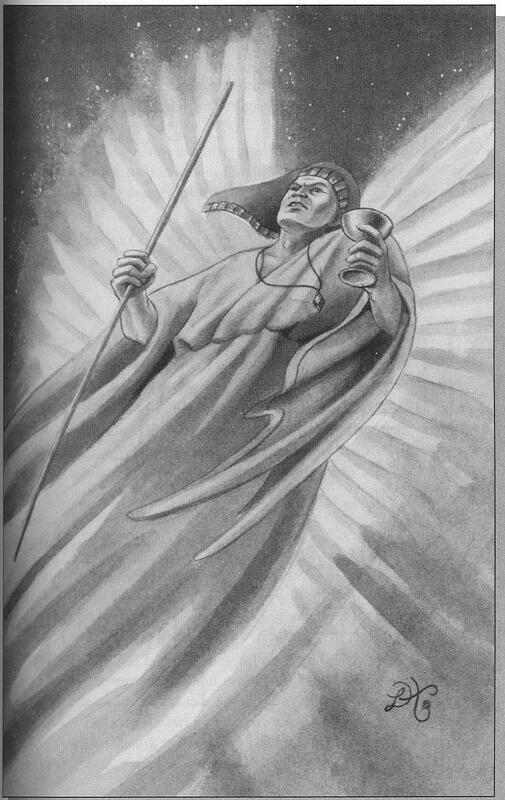 Tzaphkiel is the Archangel (of Binah/Understanding and Saturn/Ninib). He is the Prince of Spiritual Strife against Evil and, as such, makes a formidable ally against those that would do you harm. He can be frightening to those that are not ready for him but that is merely because of what he represents: the intense spiritual journey ahead that demands no less than perfection from all those that seek it. As such, those not seeking this kind of experience will seem to vanish from your life, as the energy of Tzaphkiel’s presence will instill fear in those that are not prepared for such an encounter. It is said that only the weak and unprepared turn and run. This cliché can be very true when you walk with Tzaphkiel. However, through Tzaphkiel’s assistance you can understand those things which confront you in life and learn to overcome them in the most effective, spiritual manner possible. The Archangel Tzaphkiel is also the keeper of the Akashic records, which, as you will see, can be revealed to you in time and with an increase in Understanding. This angel is somewhat intimidating to behold. He appears as a tall man wearing a black robe. On his head he wears a blue Egyptian nemyss, and around his neck, a red amulet. He often carries a dark rod in his right hand and a glowing cup in his left. His wings are bright silver in color. This archangel is omniscient in that he has seen everything that has ever occurred. As a result, he can tell you of many hidden truths, but must first be convinced of your need to know them. Make sure your intentions in asking Tzaphkiel’s help are pure, because he will be able to see through you if you are lying. From what is written in the Enuma Elish this is the power that Marduk used to create the universe. So not surprising that it knows all things. This spirit I equate to the Holy Spirit. This spirit knows all things. Difficult to summon. A time of purification greatly helps. There is no word of calling. This spirit is summoned by the force of your desire. Meaning your will and faith must be strong. Many of the sigils look like stick figure sketches of other things. In this case it could be a kneeling priest stretching his arms over head in prayer. Which befits this spirit who will know your heart and innermost thoughts. Also it resembles a Trident. The sign of Neptune god of the sea who definitely connects to Enki. I have called this spirit many times. Like the fourth spirit Barashakushu, Marukka answers prayers. Marukka identified itself to me as the power given by Enki to his son Marduk to know all things. Enki is the source of knowledge that dwells in the center of the light. After calling Marukka I had a vision in which I ran to Enki in the center of the light. When I got there (in the center of the light) it was dark. In my mind I then suddenly understood. Before there is Light there is Darkness. Enki is a Light maker [Lux Fere] and so he dwells in dark Absu. This spirit can answer all questions and has healing powers. By holding his sigil in your mind’s eye, like the Agga, you tap the brain into the Mysteries of Magick.